We are SO proud to present our best cold pressed masticating whole fruit juicer yet! Wide mouth feeding chute means no cutting up fruits and vegetables! When it tilts, it’s even better with no waste or food getting stuck in the chute. Our slow juicer is incredibly silent but powerful using masticating technology. In gorgeous jet black stainless steel, our tilted wide mouth juicer extracts your fruits and vegetables with ease! The dual stage filtration system cold press whole fruit juicer leaves a fine juice with all the goodness your body craves! Dual stage augur, which chews and presses the produce. This creates comparatively little heat and friction, retaining more nutrients, vitamins, fresh colour and natural flavour. It also produces far less separation and oxidisation, leaving smooth tasting juice that can last up to 48 hours in the fridge. 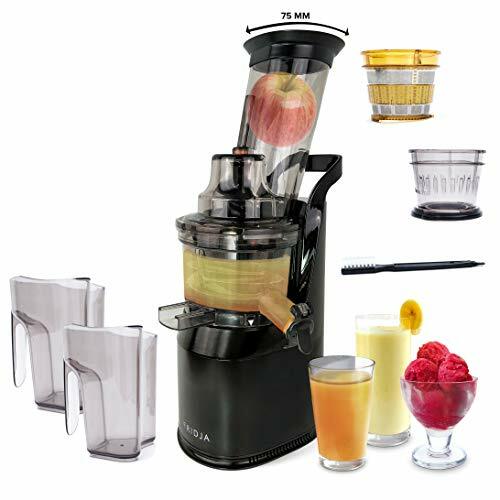 The sleek, compact upright design is finished with robust stainless steel, an amazing cold pressed whole fruit juicer! Designed for ease of use, in the UK juicer, the Fridja f1900 has only a few simple parts to disassemble and wash. Solid wastes are compacted and drier than the sloppy pulp left by centrifugal juicers. It even comes supplied with a small brush to help speed things up. ✔ 2018 DESIGN – Powerful 240W matte black stainless steel easy clean metal with large 75 mm tilting feeding tube for NO waste. Easy to assemble, operate, and clean, 100% BPA free safe parts make cleanup a breeze. Runs quietly – less than 60 decibels. Heavy-duty stainless steel and heavy stable body ensures you a quiet and calm environment when juicing and look AMAZING in your kitchen. ✔ HIGHER NUTRITIONAL VALUE – As a masticating juicer, the auger spins at 65 RPM that preserves the vitamins, enzymes, minerals, trace minerals and nutrients from being destroyed as opposed to centrifugal juicers. Keep minimal oxidation, low heat build-up, less foaming and no clogging. Uses a tilted wide mouth feeding chute for no waste and faster operation with less preparation time needed! ✔ ULTIMATE SILENT JUICING MACHINE – Extract various vegetables and fruits quickly using the tilting 75 mm feeding tube, produce such as celery, ginger, wheatgrass, leafy greens, carrot, apples, oranges, etc into cold press juice for up to 30 minutes continuously. Ideal for your clean living, antioxidant, superfood diet and multiple daily juice cleanse. Three pin UK (BS) Plug. ✔ MORE THAN JUICE – Ideal for high yield and dry pulp. Perfect machine for you to extract your fruits, vegetables, sorbets, nut milks, nut butters and fruit ice creams! Two filters included for all drinks and fruit ice cream and fruit sorbets. Comes with two 1 litre jugs and cleaning brush. Slow juicer is higher juice yield compared to centrifugal juicers by the auger squeezing and reverse function. ✔ FULL PRODUCT VIDEO OVERVIEW AVAILABLE ON YOUTUBE – For a full and comprehensive look at the Fridja f1900 whole fruit juicer, watch our video now! Tried, tested and approved. Thousands of Fridja products sold all over UK and Europe. Watch our YouTube videos now! Excellent 5 Star Juicer This juicer is great! Very well made – heavyweight but has a carry handle so easy to move around the kitchen and also a nice size. Juicing is excellent and it makes great smoothies and sorbets too! I was surprise how quiet it was, absolutely perfect for me. Fast delivery in under 24 hours. Highly recommended. Very good juicer This is the first juicer I’ve bought and it has proved to be great. Have used it for apples, carrots and celery with no issues – need to cut fruit/veg it in pieces of course but not too small. Relatively easy to clean. Sturdy and powerful, residue comes out dry. Some foam when juicing apples. It’s a bit taller than expected when fully assembled, but occupies a relatively small area in the kitchen counter compared to other juicers. So far (2 months on) so good.